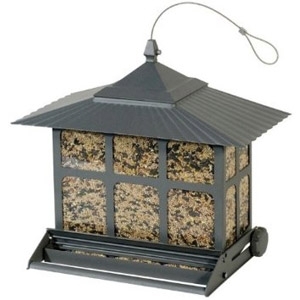 The Perky-Pet® Squirrel-Be-Gone II Wild Bird Feeder features a beautiful brushed nickel finish, four-position adjustable spring for custom settings and a 12 lb. seed capacity. A weight-activated blocking bar prevents squirrels from accessing the seed supply. Clear plastic doors and windows make it easy for you to monitor the seed level. The detachable roof peak makes for easy refilling and cleaning.